Earlier this week, I wrote about the planned development at 467 Charlton Avenue East, which came to the Planning Committee on Tuesday for approval (see item 6.8). Planning Committee approved the plan despite concerns raised by a group of nearby residents called "Residents Advocating Responsible Escarpment Development", who object to the impact they believe the buildings will have on views of the Niagara Escarpment. The article I wrote included renderings from the project website. Architect Rick Lintack, whose firm is working with the developer, contacted me to advise that there are newer renderings available which more accurately reflect the size, shape and placement of the buildings on the site. The older design had "wider buildings, more vertical features and a brighter colour scheme," according to Lintack. With respect to the older design, Lintack added, "The placement of the buildings on the site ... was not based on the survey information that was subsequently gathered." He noted that the trees south of the building were also subsequently measured and the new design reflects their accurate heights. Lintack provided an "unfiltered view" of the development, which means it does not show buildings or trees in the foreground in front of the buildings, so all three can be seen together. Lintack notes, "The site will be re-graded for the buildings to properly address pedestrian access, and extensively landscaped." The plan must still be approved by Council before the development can go ahead. nice to see the proper scale, but wow, not a fan of the new colour scheme. Would look great in the old USSR. I guess that's what happens when neighbours focus on all the wrong things. Typical for Hamilton - we get a worse design instead of a better one. Well done Stinson. Take off the blinders. The previous design was awful. I can't say that i see much difference in the colour scheme or basic design, but the new massing is a slight improvement -- i.e. less of a monolithic slab block then the first version posted. I don't see a huge difference to the building itself. The latter design seems thicker front-to-back and narrower side-to-side, the brick is darker brown, the roof line is more continuous and there are now windows going up the side. The main difference, really, is its positioning on the site. According to the architect, the latter rendering more accurately reflects the actual site layout and grading after a survey was completed. I have little-to-no design sense so I won't offer comment on whether one or the other building is aesthetically superior. Design aesthetics are subjective. Neither design are anything to get too excited about. My opinion, of course, and I don't consider myself the final word on good design either. I was more puzzled/amused by Jason's hyperbolic response ... I do get the reference to the Soviet Union and Eastern Bloc, but we could just drive east on the QEW for an hour to see a large collection of this type of architecture. Never mind. Our skyline shows up on the first couple pages of a google image search for commie block skyline. Lol. I was merely pointing out the drab colour. Will look rough in winter. There was nothing particularly commie about slab blocks ... concrete modernism was a world-wide architectural phenomenon. Toronto pioneered the flying-form construction method, which made it especially profitable, and makes the super-structure of our 1960s towers very durable (hence ERA Architects and David Miller's Tower Renewal proposal ... another progressive solution that has withered on the vine under RoFo). The flying-form is still employed and is employed in most mid- and high-rise condo construction in the GTHA. It also explains some of the design choices we see. In the Soviet Union and Eastern Bloc it is my understanding they used modular pre-fab construction, which has proven more prone to structural and envelope integrity problems. Yet, I know someone who studied an area on the outskirts of East Berlin and noted that some of the buildings are being retrofitted in a creative manner in part because the modular construction method allows for partial deconstruction and so forth. In my experience, it's hard to tell much about color and so forth from architectural renderings. To be honest, I'm not sure which I'd prefer for exterior cladding: pre-fab panels of red- or brown-brick. Everything here tends to look kind of drab during the winter months ... except when coated with fresh snow. Jason hyperbolic? Surely you jest. How about a street level view from the Rail Trail? I notice that isnt there? I would be quite surprised if you could even see the buildings from the Rail Trail. Walked the trail last night and realized, you will have to kink your neck up and to the left (ackwardly) in order to see the building walking east to west. West to east I presume you may see the buildings from a small segment of the trail. Looks like you've done your homework on this. Oh yes, the imaginary, copy and pasted, "Redwoods" posted above. There is nothing "accurate" about those trees. It is. From the top of 3 storey homes. Not the street. The city and it's planners used street images as should be the case. A handful of Stinson residents were using this pic either from someone's roof or roof level unit at Stinson Lofts. Yeah its from the penthouse of Stinson School (SW corner). The picture shows, to me, that the renderings that include trees look remarkably accurate for a rendering. agreed. Renderings aren't perfect, but it seems the architect/developer have done a good job here trying to ease concerns. Would be nice to see this from all developers. I'll agree that they're doing a good job trying to ease our concerns. 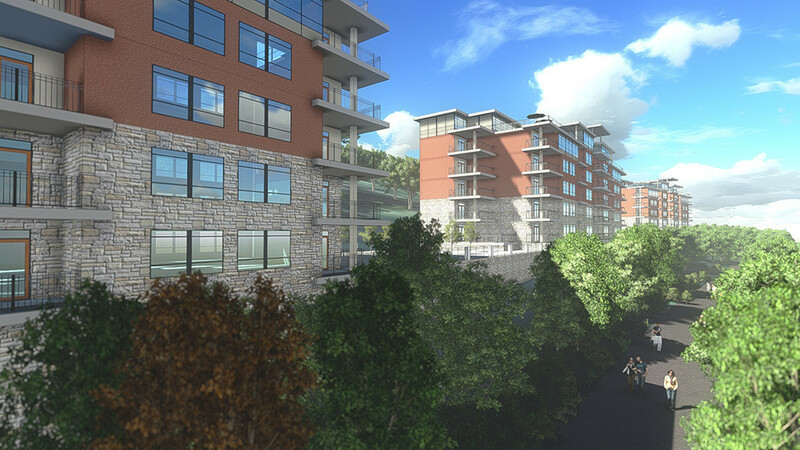 I don't think the renderings look accurate, simply because the trees are all the same size, the escarpment seems taller and so far, they all show a retaining wall at the brow. They have said they haven't actually designed the building yet, and the architect does claim to be sensitive to the surroundings, so perhaps I'm wrong and it will all be fine. I will say that the property owner has hired professionals to develop it for him. It all seems to be another day at the office for them. Still, if it was scaled down a bit, higher end and a beautiful design I'd be much happier with whole thing. I think it's important to continue to remind the developer how important this site is to the neighbourhood. Civic engagement and all. Trees die, get diseased, lose their leaves, fall over and get cut down. Claiming it will be hidden by vegetation seems pretty weak. The buildings themselves need to fit into the escarpment and add to the vista. The resident opponents should concentrate on working with the developer rather than taking to OMB. It is, and if I can see the line of Charlton here, I'm going to see those buildings. looks amazing! love the new glass balconies. great development for a great neighbourhood! agree. The glass balconies and massing a nice addition. Will be great for the neighbourhood. Oh well that's better. We'll just photoshop some trees into it! You'll never see the buildings that way. Magical 30 meter high trees that appear from nowhere and all look exactly the same. Please tell me you're not actually buying this nonsense. Look at the first two photographs. Do you see that tree line on the edge of the slope? Those trees will be cut down before they even start building. Those are the supposed trees that would block view of the building. 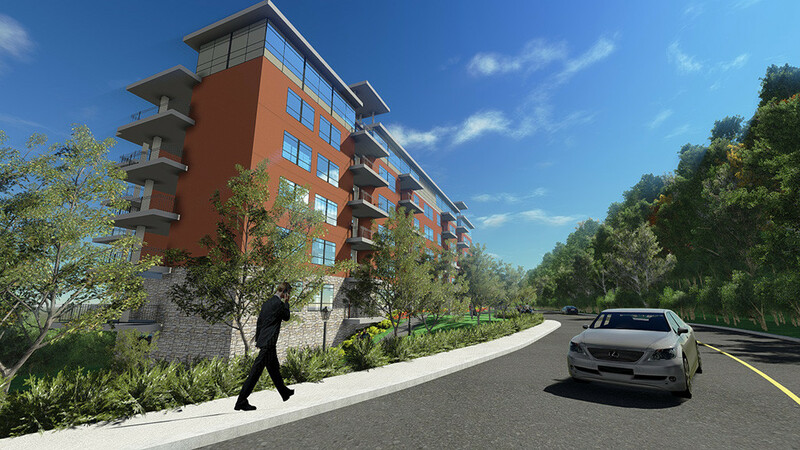 Do those trees look as tall as the imaginary trees in the rendering? No, they're shorter than the utility pole. Do you see a line of (much) taller tree's behind those trees? No, the land slopes downward from there. Why on earth would they care about the view, if the entire building is going to be hidden by trees? Why would they undertake an expensive and complex build to build condo's with a view of trees? They wouldn't nor would they want to hide their buildings. Walk along Stinson and look at the site. These three monoliths are going to overshadow the entire neighbourhood and dominate the entire view of the escarpment. You'll be able to see them from East to Cumberland, and they're going to spoil one of the few nice things about the Stinson neighbourhood. That is assuming they don't take the whole plateau down during the construction. These are NOT being built on solid land, this is fill. According to the construction manager, they're digging down to the base of the escarpment, installing pylons and building the buildings on those supports. Again, it's about trust and my trust weakens with every lie and misrepresentation. I'm still stunned that the planning committee accepted "vegetation" as appropriate visual mitigation. How about finding some actual problems (and eyesores) to fight? How about the scar that is the claremont/victoria ramp that rips through that area? Or the stupid useless one-ways? What a waste of energy. I hope they build this and it fills with people from Toronto who understand how real cities work and they can start fighting some real battles. well said. The complete lack of any amenities within walking distance to this site is another indicator of how damaging the expressways have been to this part of town, and the whole lower city, for decades. I know Stinson spoke about a possible cafe across from the loft project, but I suspect the NIMBY crowd would go nuts. Any great city I've been to has amazing little neighbourhood cafes and eateries tucked away for the local residents to gather at. In Hamilton other than the rare street where everything is clustered, you have to drive everywhere. Would be great to see one or two on Stinson and tucked into most neighbourhoods. Toronto has these same walkable amenities and it greatly enhances the quality of life. Another area where Hamilton not only lags, but city hall opposes needed change. I'd love a neighbourhood cafe/ice cream/vegetable stand. I think this is Hamiltons inflexibility in zoning. Business goes here, industrial goes here and residential goes here. Remember this zone was light industrial and Stinson needs jobs more than it needs condos. That's one thing I miss about German neighbourhoods. You always had an interplay between shops, restaurants and bars within a neighbourhood and on smaller streets. In Hamilton and in Ontario in general the lines are too stark, main streets are for business and side streets for residential. This is especially true in new developments. Neighbourhood shops add great character and convenience and make cities far more walkable. I've realized even in my North American travels that Hamilton is probably the worst city for this (not comparing to new suburbs of course). We literally have none. I was on my bike last week and saw folks enjoying the patio on Emerson at one of the pubs south of McMaster. Was a great sight in the middle of the neighbourhood. TO, Montreal, Van and any major US city I've been to have cafes, bakeries and establishments in the middle of neighbourhoods. Heck, even Buffalo has a ton of them. Hopefully Jason Thorne can drag our planning staff out of the Mississauga mindset. It's funny you mention Emerson because whenever I'm talking to people about this phenomenon in Hamilton I always use that section of Emerson as my reference for what could and should be found in neighbourhoods all over the city. I think pretty much everyone would like this. Our hood overwhelmingly supported one but staff still said no. City hall is the drag here, more than citizens. the top of stable slope and the top of bank were identified on the applicant’s revised conceptual plan, and development would occur outside of these areas on stable land. The existing vegetation along the top of bank would be mostly undisturbed and retained (i.e only four existing trees would be removed along the north slope). In addition, a geotechnical study was received to examine the stability of the slope and was determined to be satisfactory to the Hamilton Conservation Authority. I know that's what it says, but that is not what the developers construction manager told the planning committee, and it's also not what the renderings show. You can watch Joey's feed if you like. Understandably there are trust issues with a staff report. I plan to take video looking south from the rail trail to provide a before and after of the north slope of the property. I don't expect to any trees on the north slope. I asked the architect point-blank if there are any changes from the staff report, specifically with respect to the number of trees removed (just four) or construction on the unstable slope. The architect replied, "The report sent to committee is absolutely correct." Perhaps we don't understand what "stable slope" means in a geotechnical way. Mr. Lintack was present when Mr. Black explained the building process. The footings are going 4m into the hill and will bear all the load from the building. The new renderings are exactly what I was hoping to see (all three buildings, and context with the tree line). They have erased my concerns with this project. Lets have more like it! Knowing this site, I would be most concerned with the rear of the property and how they interface with the trail network in behind. I hope the abandoned miniputt course isn't removed. They should make the golf course an added benefit of living there. Who wouldn't like a mini-golf course as a perk of buying a condo there? the build site is a former bowling alley that had mini put down below. next time you are on the rail trail and directly below the build site, climb up the level embankment bewteen the trail and the build site. lots of stuff still there. the putting greens, old timey light standards, scattered remnants of putting traps and scale windmills. pretty cool. 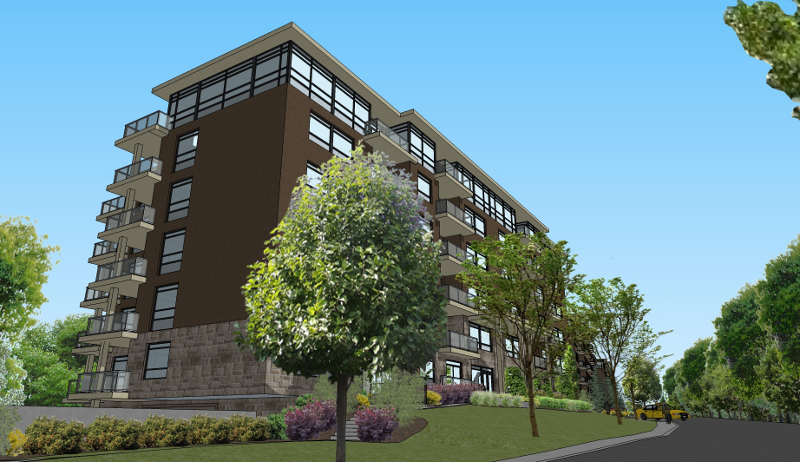 Great design at a Burlington condo project that just won an Ontario architect award. Molinaro continues to wow in that city as well. Our grand-kids will chuckle when we try to tell them that Burlington used to be a suburb of Hamilton, and not the other way around. At least we are single-handedly keeping members of the OMB employed. Keep up the good work Hamilton NIMBY's.